Paint the outside of the egg box brown, the inside red and let it dry. 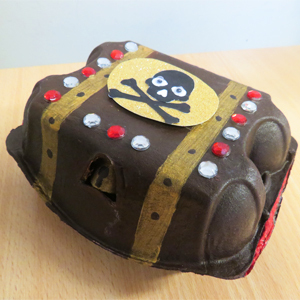 When the paint has dried, paint on the gold strips on the treasure chest and the golden lock and draw on a keyhole using the black felt tip pen. To make the plaque, cut out skull and bone shapes from the black card, and place them on an oval-shaped piece of gold card. Decorate the chest with the plaque and the gems, then stuff it with all your treasure. Stick the plaque onto the front of the treasure chest with the glue stick. Decorate with gems and then insert your treasure chest treats! Cut the egg box into individual egg cups and paint each cup a different colour. Once dry, use the PVA glue to attach each segment together. Cut up an egg box so you have the shape of a mask, with two cardboard egg cups for the eyes and a cardboard column in the middle for the nose. Pierce a hole in the bottom of each egg cup to see through when you wear the mask. Paint the whole mask white and when it’s dry, paint on the black spots and the nose. Add on any extra details using a black felt tip pen such as the dog’s pores. Use the egg box lid to cut out the dog’s floppy ears and tongue, then paint them and leave them to dry. 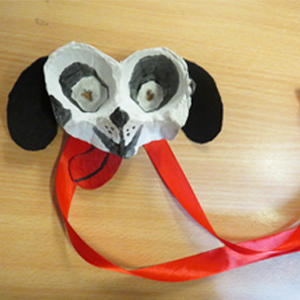 Assemble the mask by sticking on the ears and tongue, then Sellotape the ribbon onto either side of the mask. Cut the lid off an egg box and save it for the next craft. Paint the inside and outside of the egg box pink and leave it to dry. 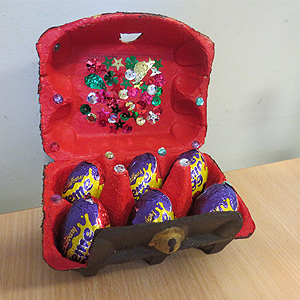 Decorate the outside of the egg box with googly eyes and coloured felt pens. Cut out a bow tie shape with the blue card and stick below one of the faces, tie the ribbon into a bow and stick below the other face. Place the cotton wool balls into the egg box and then sprinkle on some cress seeds and water. Place the cress heads onto a window-sill and keep them watered enough so that the cotton wool is always damp. 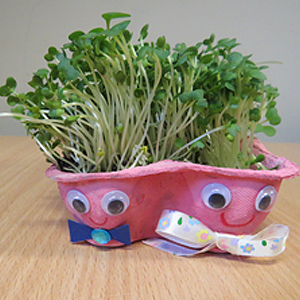 Watch each day as the crazy cress heads grow their hair over 2 weeks! Cut out three egg box cups and paint one orange, the other yellow, and then leave them to dry. 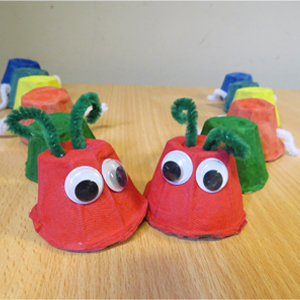 Stick the googly eyes on the inside and draw a mouth on each of the faces using the red and black felt pens. Then cut out 18 petals from the yellow card and stick 6 of the petals to the back of each funny-faced daffodil. 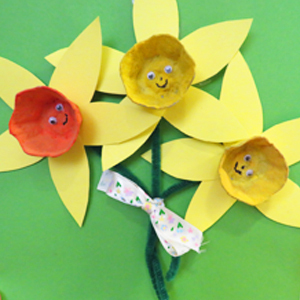 Stick the flowers onto the end of the pipe cleaners with the glue and your dizzy daffodils will look blooming brilliant! Cut the egg box to make 6 separate egg cups. Cut around the edges of each egg cup to make petal shapes and paint each one a colour of your choice. 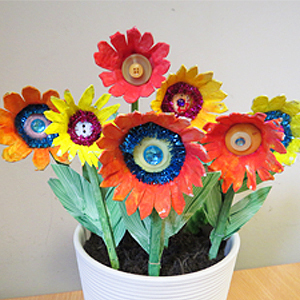 After the paint has dried, stick down the pipe cleaner on the inside edge of the flower, then a button in the centre of each egg cup, and then stick the gems on top of the buttons. Cut out 12 leaf shapes from the white card. Paint the wooden sticks and the leaf shapes with the green paint. Once they are dry, use the glue to stick the leaves to the back of the wooden sticks. Once the glue has dried, stick the decorated flowers onto the front of the wooden sticks at the top, and leave face down to dry. Once dry, place into a plant pot filled with soil and be blown away with this amazing masterpiece!